Last Friday, Shine Lawyers teamed up with the NRL, NSW Government, Australian Drug Foundation, the Australian Federal Police and the NRL Respectful Relationships group to launch a series of educational modules and DVDs, known as “Better Choices”, with the aim of teaching teenagers how to make better decisions in real life situations to avoid serious and lifelong consequences. The program includes scenarios based around alcohol misuse, illicit drugs, respectful relationships, filming and distribution of private acts without consent, violence on and off the field, social media and cyber-bullying. It consists of five modules which will be delivered to Junior Rugby League Clubs and youth competitions across NSW by trained NRL facilitators and Ambassadors. The program was built on a concept developed by Shine Lawyers Adair Donaldson, one of Australia’s leading advocates in the prevention for education. “It is incredibly important to educate young people about the legal consequences of their actions, which may change their life paths forever” said Mr Donaldson. Sydney film maker Drew McPherson was engaged to develop this series of videos, while four of the five modules are based on real life situations that regularly happen and require legal support. “We hope this information is engaging, age specific and relevant to this target audience. If we can push these responsible messages at this age we can make significant cultural changes in years to come. Better Choices has been produced in partnership with the NSW Government, and with the support of Shine Lawyers, Australian Drug Foundation, the Australian Federal Police and the NRL Respectful Relationships group. 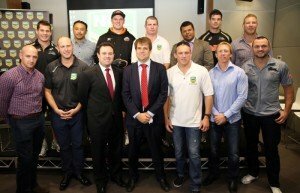 NSW Minister for Sport and Recreation, Stuart Ayres MP said the NSW Government strongly supported the program. “Adolescence, as every teenager, parent, and youth professional knows, is a time of change,” Mr Ayres said. “With greater freedom and independence, young athletes face new choices involving cars, alcohol, drugs and sexuality—quite often in combination. Poor choices about these risks can have terrible consequences for individuals, families, and society as a whole. Written by Shine Lawyers on June 17, 2014. Last modified: September 26, 2018.